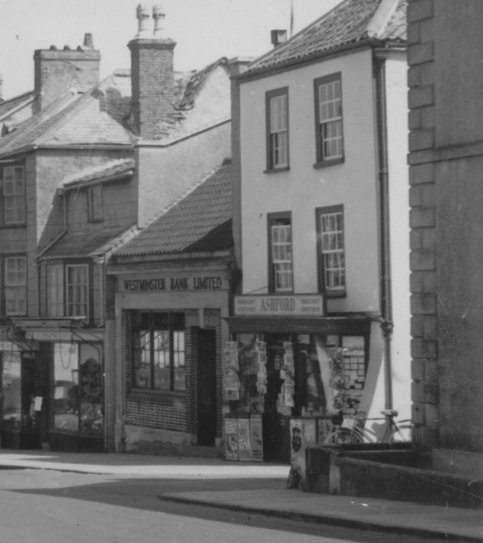 The photographs in our collection show some major changes in building which became known as 31 High Street. In the earlier photograph shown on the left, the property is the tallest three storey building in the centre of the photo. By the time of the second photo (on the right below) which was taken in 1950s this building had been demolished and replaced by the single storey building which was built for the Westminster Bank in 1932.
treet). The will shows that George’s property ‘adjoined on the north side to a messuage late in the occupation of John Longman perukemaker and now of Isaac Pullin a currier‘. John Longman – the land tax records show that John had been occupying the owner and occupant of the property from 1775 or earlier. The 1770 assessment of poor rate listings show John was probably there in 1770. The will of George Cossham dated 1785 referred to above shows that John was a perukemaker (i.e. wigmaker). It seems strange that there was another John Longman who was innkeeper of The Lamb (then at 29 High Street) between 1754 and 1757. They may have been the same person or father and son. One John Longman married Hannah Pearce on 20th October 1751 which would rule him as being the innkeeper in 1755. Their son, William, was born on 6th May 1757. When William was baptised on 30th December 1788 the baptism record showed that his parents were Quakers. The 1780 and 1781 land tax records show that John was renting out the property to Benjamin Pearce (see below). The 1783 land tax record shows that John was renting the property to Mr Pullin (presumably the Isaac Pullen mentioned as being the occupant when George Cossham wrote his will in 1785 referring to 33 High Street). We note that the 1784 land tax record shows that George Rolph was the owner of the property and ‘Longman’ was the tenant. We cannot explain this, although it is possible that John may have died and that George, as a solicitor, was acting as the trustee of his estate. Benjamin Pierce (or Pearce) – we assume that Benjamin was the Benjamin Pierce born on 18th November 1741, the son of Benjamin and Hannah Pearce. His father was likely to be the one who was a tenant of the property next door (29 High Street). Benjamin was not baptised until 13th October 1762 which might suggest that he was a Quaker like the Longmans who owned the property. On 14th March 1763 Benjamin married Sarah Thurston in Thornbury St Marys Church. The witnesses at the wedding were Martha and Susannah Thurston. Benjamin and Sarah had at least one child, Sarah, who was born on 9th May 1765 and baptised on 31st July 1765. The baptism record indicates that Benjamin was a barber. He is also described as a perukemaker (a wigmaker) in the deeds of the property now known as Dot Cottage, 7 Castle Street. Benjamin and his wife, Sarah were owners of that property on 13th May 1768 when it was being let out to a tenant. Then on 15th August 1771 they sold it for £20. The 1780 and 1781 land tax records show Benjamin was occupying John Longman’s property at 31 High Street. The 1782 and 1783 land tax records show Benjamin had moved to 41 High Street. Benjamin died aged 46 and was buried on 31st March 1790. Sarah may have died aged 68 and was buried on 5th March 1800, but if this information is correct and she was Benjamin’s widow then this would make her 13 years older than Benjamin when they married. Abraham Riddiford – the land tax records from 1796 onwards indicate that Abraham Riddiford owned and occupied this property. It appears from these records that Abraham used this property as his home and shop. He was a grocer. He let out his other properties in Castle Street and later Silver Street to tenants. Abraham died aged 66 and was buried on the 27th January 1831. The 1831 and 1832 land tax records indicate that the property was then let to Jno. Hopkins. Thomas Bevan – the 1859 Rate Book shows the property occupied by Thomas Bevan. The 1861 census also shows Thomas occupying the property. He was described as an innkeeper aged 42 from Thornbury living there with his wife, Ann aged 36 and 9 children. George Ford, the local pub historian, says that this pub was known as ‘The Lamb‘, but we have found nothing to confirm this. Henry Trayhurn – the 1867 Rate Book shows the property owned by Harriett Mawley was occupied by Henry Trayhurn. The 1871 census shows Henry was a tailor aged 41 living with his wife, Hettey aged 40 a draper, both born in Thornbury. Henry was still listed as the occupant in the 1876 Rate Book but by 1880 his name was crossed out. A sale of Henry’s stock and fixtures from his drapers, tailor and haberdashers shop was held on 3rd and 4th January 1881. The notice said Henry was ‘giving up his business’. We must admit to some confusion over Henry. There were two other Henry Trayhurns born about the same time, both tailors with Thornbury connections. One of the other Henrys was born in 1823, the son of John Trayhurn a tailor and his wife, Hester. He lived in Chapel Street with his parents, never married and died in 1871. Another Henry married Hester Davis in Bristol in 1841. In the 1841 census this Henry and Hester were living at 37 High Street. Henry was a tailor aged 20 and his wife, Hester also aged 20. We don’t know what happened to this Henry and it is possible that Hester died and Henry re-married. We believe that the Henry who was living at 31 High Street married Hettey Wither Beale in Bristol area in 1842. Hettey was baptised in Oldbury on 18th March 1821, the daughter of John Beale a cordwainer and his wife, Elizabeth who both lived at Cowhill. We note that in the 1861 census they were living at 84 Frederick Street in Cardiff. Henry Trayhurn was described as a tailor aged 33 born in Cowhill living with Hetty aged 32 who was born in Chewstoke. We don’t know what happened to Henry and Hettey after they left Thornbury. John Hodges Williams – 1880 John Hodges Williams had become the tenant of the property still owned by Harriett Mawley. We are not sure what John did with the property. He started his business career as a draper based in Victoria House, High Street, but he went on to acquire several other properties in the High Street and to extend the range of goods in which he traded. An indenture dated 1932 when John sold the property to the Westminster Bank refers to the property having been known as ‘Bon Marche’. We know however from other documents that Bon Marche was the name John used for his premises at the corner of the High Street and The Plain. The 1932 indenture referred to above mentions an earlier conveyance dated 20th March 1902 between Harriett Luce Chambers and John Hodges Williams. This appears to be a reference to when John Hodges Williams bought the property following Harriett Mawley’s death in 1901. Harriett Luce Chambers must have been Harriett Mawley’s executor or heir. Westminster Bank – on 13th October 1932 John Hodges Williams sold the property to the Westminster Bank for £250. It was described as ‘all that piece or parcel of land situate on the east side of the High Street in the Town and Borough of Thornbury and numbered 180 on the Tithe Map of the said Parish and being bounded on the north by property of Messrs Councell and Sons and on the south or on some part thereof by property belonging to Leonard Smith. Together with the shop and some ruinous buildings standing thereon or on some part thereof and together also with a right of way over the lane on the east side thereof to the road adjoining known as the Back Street or St Mary Street which said property is now or was some time since known as the Bon Marche‘. The closure of the newsagents shop at 33 High Street enabled them to acquire the property and expand. They demolished the old newsagent’s building and erected the two story building. In 1969 the Westminster Bank merged with the National Provincial Bank and on 1st January 1970 the Natwest Bank opened for business. We assumed that at that time the new bank chose to consolidate its branches in Thornbury, closing the branch at 31/33 High Street in favour of the old National Provincial Bank on The Plain. The two buildings were subsequently used as a branch of the Britannia Building Society, until it closed in 2015.